I wake up alone in our bed a little past noon, my delightful roommate has long since gone to work. I can barely recall her leaving as I finished my last shift about 6 am. I patrol trains in speeders which means I travel ten minutes in front of the trains and check the tracks for rocks and track defects. In our territory the trains usually move at about 20 miles per hour and this is great because our speeders don’t go much faster. Patrol Speeders are yellow one-man track cars. The base is five feet long by four feet wide and about six feet high at track level. Two large windshields on the front of the cab give the impression of eyes and impart a sense of personality to this awkward shape. The operator sits beside a canvas curtain for a quick exit if necessary. At one time there were lots of guys dying on this job due to boredom and drinking alcohol, falling asleep and running into trains. I have never had a drink on the job or worked with anyone who does, but even so the guys dying on this job are still about one per year. I like being out on the tracks and I drink coffee not beer. Today I will have a strong coffee with some oatmeal then go to the swimming pool, swim a mile and sit in the sauna. I will be home to cook dinner with my girl, make a lunch and get ready for my evening shift. I work a swing shift that has progressively earlier start times throughout the week so I get extra time on my days off. At 9 pm I drive down to the Yard Office at the North Vancouver Passenger depot, mile 0 on the British Columbia Railway. The passenger train crew is checking out as the crew for my train is checking in. The train crews are usually pretty caught up in the drama of railway life. B.S. from the North combines with the B.S. going north in a great tide of gossip circulating between North Vancouver and Lillooet, the end of our Squamish Subdivision. I am there for my Track Line-up. I must decipher meaning from train numbers locations and times, divided into North and Southbound traffic. My pressing issue is where the trains will meet on my shift. I ask the engineer where there train orders take them and ask him to give me a call when they are leaving. The train I patrol is Number 23. This train is designated the VP that is Vancouver to Peace River and it is the backbone of the freight schedule through out the railway. We generally meet a southbound Number 16 (PV) within our patrol territory. If I can’t talk to the engineer I can get my line up and any important information from the Operator. This is the person who copies and gives out the train orders, the operating instructions to the train crew. Then I drive down three miles to the speeder sheds. They are directly below the Lions Gate Bridge on the Capilano River. The setting is often beautiful with a great view of the ships entering the Vancouver harbor at First Narrows. The speeders are kept behind individual door sets, each with its pair of light rails running out to the Main Line. I roll my speeder out and start it up. This entails a hand crank inserted into the right side of the engine, a skillful combination of one hand flipping a timer lever and pulling the choke while the other hand is cranking the engine; guarding against backfiring and spraining a misplaced thumb. A well maintained machine starts with one or two pulls. With one's own machine all should go smoothly. After loading my personal gear and fueling up it is time to head out over the Capilano Bridge and enter the Mainline at Ambleside. The company is running long trains and 23 usually has a “double over.” That is where the head end portion of the train pulls out and backs on to the tail end portion. There are often “remotes” - engines set into the middle of the train. 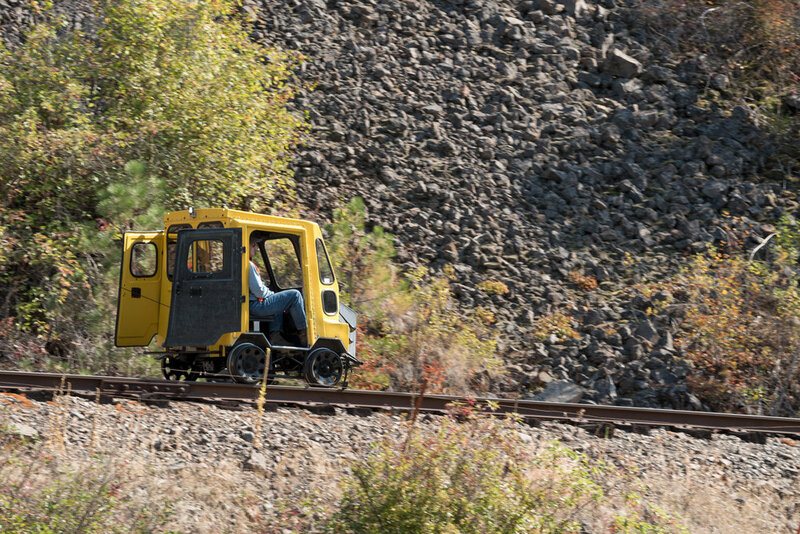 With crossings engine and air brake tests it can be thirty to forty minutes before the train pulls out of town. So I have a while to wait before I start my patrol. I motor slowly through the crossings in West Vancouver and head out over the Sea Wall. I used to be embarrassed by the people staring at me but after a while I recognized they were looking at the speeder not me at all. That is until someone waves. That friendly signal sets off a railroader's synapse and you find your self waving and grinning at that friendly soul. I roll up to mile 5 point 5, which is a deep earth cut just north of Dunderave Village in West Vancouver. When I get the call from the engineer I motor along the tracks through the back yards of West Van. I give him a call in and out of the mile long tunnel at Horseshoe Bay. Out of the tunnel we are perched over the ferry dock at Horseshoe Bay. The bright yellow Halogen lights of the ferry terminal fill the area with constant illumination. Here the rail bed is carved from the granite bedrock. The cliff faces will spill off a few rocks for us but generally they are pretty secure. Over the years there have been a couple of stolen cars dumped off the Highway above by people thinking there was a direct drop to the ocean. The tracks twist around some three miles to Sunset. Just north of there I can look back and see the train headlight come by Horseshoe Bay and I establish my distance at three miles ahead of the freight. On this night 23 is meeting at Cheakamus a siding 20 minutes north of Squamish. I plan go to Squamish ahead of this train and clear the tracks and then take the southbound from Squamish to North Van. Riun Blackwell worked thirty years for BCRail, happy to be a patrolman. He moved to Squamish 1990 where he raised his family and still lives. Riun is one of the founding members of the Squamish Writers Group and the inspiration and driving force behind Squamish's Story of Mine.